An operational amplifier (op-amp for short) is a type of amplifier circuit packaged in an IC package. In electronic hobby circuits, many op-amps are packaged in 8-pin DIPs (Dual In-line Packages). Op-amps may also be packaged in bigger DIPs such as 14-pin packages. These IC's would usually contain two or four op-amps. 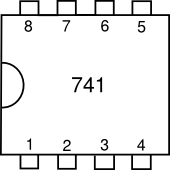 The schematic symbol for a LM741 op-amp is shown here. The LM741 is a common op-amp used in many hobby circuits. It is housed in a standard 8-pin dual in-line package (DIP). In some circuit diagrams, the op-amp symbol is shown without the power pins or other pins, as shown below.